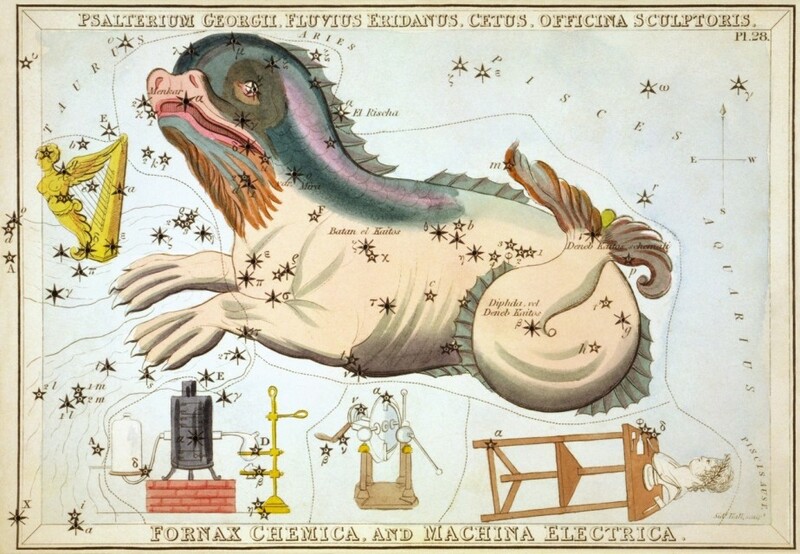 Constellation Eridanus the River, is a southern constellation under constellation Taurus constellation, between Cetus and Orion. Eridanus spans 90 degrees of the Zodiac in the Signs of Pisces, Aries, Taurus and Gemini, and contains 15 named fixed stars. Eridanus represents the river Padus or Po into which Phaeton fell when slain by Jupiter for having set the world on fire by misguiding the chariot of his father Phoebus. 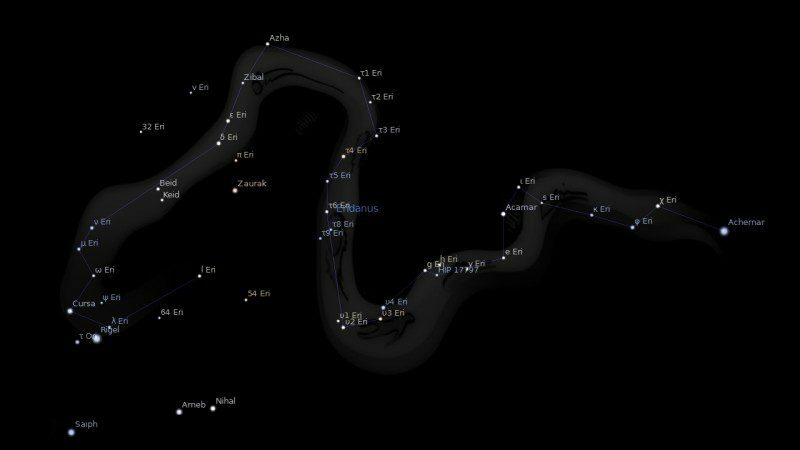 Eridanus, the River, is divided into the Northern and the Southern Stream; the former winding from the star Rigel of Orion to the paws of Cetus; the latter extending thence southwards, southeast, and finally southwest below the horizon of New York City, 2° beyond the lucida Achernar, near the junction of Phoenix, Tucana, Hydrus, and Horologium. Excepting Achernar, however, it has no star larger than a 3rd-magnitude, although it is the longest constellation in the sky, and Gould catalogues in it 293 naked-eye components. It issues forth, in all the pictures, from the down-coming foot of Orion. While others see in it, from the ignorance of fabled story, only “the River Po,” or the “River Euphrates,” we see in it, from the meaning of its name, and from the significance of its positon, the river of the Judge. In the Denderah Zodiac it is a river under the feet of Orion. It is named Peh-ta-t, which means the mouth of the river. It is an immense constellation. According to the Britannic catalogue, it consists of 84 stars; one of the 1st magnitude, one of the 2nd, eight of the 3rd, etc. 1. Fixed Stars and Constellations in Astrology, Vivian E. Robson, 1923, p.44. 2. Star Names: Their Lore and Meaning, Richard H. Allen, 1889, p.215. 3. The Witness of the Stars, E. W. Bullinger, 30. Eridanus (the River). The International Star Registry has named a star in eridanus after me but I don’t see it. Does anyone think I have been duped?